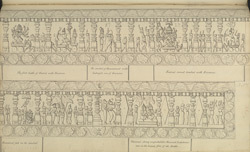 Pen-and-ink drawing of the seventh narrative sequence of the Ramayana carved on the open hall of the Amriteshvara temple at Amritapura in Karnataka. This drawing is taken from an album of 156 drawings (185 folios) chiefly of architecture and sculpture in S. India, dated 1803-08. Some drawings are by MacKenzie himself, others by his assistant surveyors and draftsmen, including H. Hamilton and J. Newman. The Amriteshvara Temple at Amritapura, located 110 km from Hassan, is a beautiful example of Hoysala architecture decorated with fine sculpture. An inscription records the building of the temple in 1196 AD. The Hoysalas were prolific temple builders and during their rule (circa 1006-1346) they built nearly 700 monuments in Karnataka. The Amriteshvara, which is dedicated to Shiva, consists of a sanctuary with its tower, a vestibule, a closed hall, and a large open hall. The open hall is approached through entrance porches in the four cardinal directions. It has half-open walls with slanting seat-back remarkably carved with narrative panels from the Hindu epics. On the south face of the railings of the half-open hall there are 76 narrative relief panels that retell episodes from the six kandas (books) of the epic of the Ramayana. This Sanskrit epic tells the story of prince Rama and his wife Sita as they went into exile, accompanied by Rama's brother Lakshmana, and how Sita was abducted by Ravana, the demon-king of Lanka, and rescued with the help of Hanuman, the king of the monkey tribes. It is the earliest Indian epic, attributed to the sage Valmiki and dated to between 500 BC - 4th century AD. The panels begin on the south face of the portico which connects the open hall with the closed hall and run anti-clockwise towards the east, terminating on the east porch. This drawing depicts the sequence of the panels 63-75. The scenes represented are from the Yuddhakanda and depict, from left to right, starting from the top: Ravana and Rama face each other; Rama and Lakshmana in chariots face Ravana; Vibhishana and Sugriva; vanaras; Ravana's head is cut off; vanaras' glee; vanaras' glee; Rama shoots Ravana; the fall of Ravana; Vibhishana is crowned; celebration; Rama and Lakshmana; Sita arrives; soldiers. The narrative ends at the east entrance.